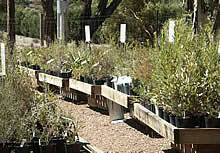 A specialist native plant nursery with over 2000 indigenous and selected native species for all your gardening, landscaping, farming and environmental needs click here to search our extensive on-line catalogue..
Goldfields Revegetation invites you to visit our award winning native plant nursery to see and learn about the unique plants and wildflowers of the Goldfields region. Enjoy a relaxing stroll around our nursery and through our Wildflower Walk. A visit in Spring is inspirational as the majority of our indigenous plants are in full bloom at this time. Select from over 2000 native plant species, some rare and endangered; you will be amazed at the variety. We offer plants at all stages from seed to tubes to advanced plants and expert advice on what plants are best suited to your environment. We have plants for attracting birds, food & medicinal plants, aquatic plants, cut flowers, climbers, ground covers, herbs and grasses. Also trees and shrubs for erosion and salt control, farm forestry, honey, fodder, windbreaks and screening. Browse in our Environmental Shop for cards, unusual gifts, books, nesting boxes, bird feeders, rabbit guards, terracotta pots and environmental information. Available in tubes, 150mm pots and a limited range of advanced plants. Orders for large quantities need to be placed in December for the planting season. Native plants suitable for erosion control, grasses, rushes, and sedges, aquatic plants, salt tolerant species including Old Man Salt Bush, selected farm forestry species and fodder plants (contact us for more information). From species for your home garden to bulk quantities for revegetation sites. Site Inspection, Environmental Management Plans, Seed Collection, Direct Seeding, Contract Growing and Planting, and Revegetation Proposals for Environmental Effect Statements. Some rare and endangered species, cut flower species, bird attracting species, Koorie food and medicinal plants (contact us for more information), as well as additional plants not listed here which may be in stock from time to time. We have freshly cut or dried native plant wildflower bouquets, terracotta pots, bird feeders, nesting boxes, garden ornaments, gift vouchers, books, literature and cards as well as rabbit guards and other selected items. A guide to establishing wetlands and improving degraded wetlands. Why have you chosen to buy a bush block? You probably chose it because you appreciate the beauty of our natural environment and want to live in harmony with the flora and fauna of your local area. These plants are available all year, fresh cut flowers available in season. Wildflower bouquets made for all occasions.